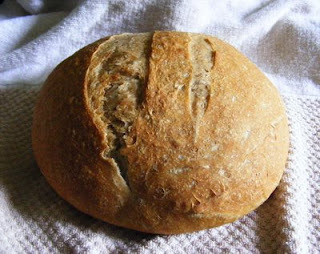 This is a good loaf to have with soup but I like it with fresh butter and a salad too. Weird I know but what can I say, I like weird sometimes. It's easy as going to the bakery to buy your bread and you will be glad you did it yourself. It looks like bakery bread with the slashes on top. This is What's Cookin on Beaty's Creek today. The creek is up today due to all of the rain the last few days, Spring is definitely here. Pour water into your Kitchen Aid Mixer, sprinkle yeast on top of water, let it set until slightly foamy, now add the rest of your ingredients and mix until you have a sticky dough. I knead in my mixer for 15 minutes, not very long when you think about how good this bread is. Let bread double in size covered in a warm spot in your kitchen. When doubled, break dough into 3 pieces, which you will make into round loaves, you achieve this by rolling the dough under in your hand. I place mine on a Silpat and then let the loaves rise for 1 hour, once bread has risen slash the top of the loaves a couple of times. Bake at 450' for 25 minutes.